William L.K. lives in the suburbs of New York with his wife and two children. He began writing creatively as a teenager and has written and produced several successful plays and musicals in the NY area. William earned his B.A. and M.S. from Dowling College. 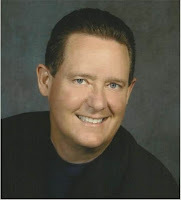 He is currently a professional musician on the weekends and a science fiction/fantasy author during the week. So many books to read... So little time to read them all... But I'm still finding time, snatched between job applications, more edits on the novel, emails, cooking, cleaning... Hey, I even did some yardwork today when it wasn't snowing! As usual, click on the link to find my reviews on Gather. And if you come back on Friday you'll find a guest post from author William L.K., whose books The Eye of the Storm and Barok's Exodus were amongst last week's reviews. The Girl with the Dragon Tattoo, by Steig Larsson: I had to read this. I enjoyed watching the movie with my husband (though I'll probably watch the US version when that comes out too). And the character of Lisbeth is just so intriguing. My verdict--the book's even better than the movie (apart from a rather slow start). I belong to a local writers' group and we run challenges and competitions every month, sharing our work with each other on a private website. It's a great way to share without risking issues with copyright or copying, but it's not a very good way to advertise the group, since no-one can see it. So... this week I tried to make a public site. Is it really so long since I posted any links to book reviews? No wonder the list's so long. Anyway, here goes, and as usual, just click on the links to read my reviews on Gather. 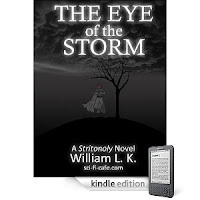 Two science fiction books: The eye of the storm, and Barok's Exodus, books 1 and 2 of the Stritonoly Chronicles, by William L.K. (who I'm hoping will visit this blog soon). The novels are both fairly short, operatic in scope, with some deeply imagined characters and backstory. I tend to prefer more real science and historical myth, but they're certainly interesting. One young adult fantasy: Curse of the Opal by Christy Frazier is the first of a new series with very contemporary high school girls interacting with Pirates of the Caribbean. I just got a lovely review of Black Widow from P.L. Crompton, author of the Last Druid. I still can't get over the fact that we were both writing about the same period in history--the end of Rome in Britain--at the same time. The Last Druid is a beautiful imagining of people, culture and life at the end of Roman rule, and the author's research just makes it all the more real. (Click on the link for my review on Gather.) There's a strong female character, real danger and prejudice and empowerment, Druids who simultaneously intrigue, enthrall and frighten, and a world that comes to vivid life. I really enjoyed it. Steve O'Brien's Young Adult novel, Elijah's Coin, was a fascinating read with some serious lessons revolving round the curious Elijah who gives a special coin to a wounded young man. You can read my review of Elijah's Coin on Gather by clicking on the link. I'm delighted to welcome Steve to my blog today to tell us more about his book and where the idea to write it came from. The concept for Elijah’s Coin is an adaptation of historical Jewish writings about the prophet Elijah and his use of coins as symbols of transformation. Last week was a bad week. My Mum went back to England after two months here with us. The house feels empty and quiet. Even the washing machine's finally finished its job. Meanwhile my husband reminded me that I need to go back to work if we're ever to earn enough to retire. I'd rather write, but it doesn't pay the bills. Last week did have its good points though. A.F. Stewart wrote a lovely review of Refracted on her blog, and it's a really cool blog too--well worth a visit. Erin O'Riordan posted another lovely review of Refracted on David Weisman's blog (he's got a fascinating post on "leveraging Facebook" there today). It's definitely cool to see Refracted included in a list or Favorite Weird Indie Fiction of 2010, and to be mentioned in the same post as Peter Joseph Swanson... Wow! He's one of the first indie authors I ever met when I joined Gather all those moons ago. My Mum's been delightedly reading the Warriors books and is way ahead of me. You can tell she's a cat-lover, but I'll catch up soon. First I had these other books on my to-read shelf, and really enjoyed them. Elijah's Coin, by Steve O'Brien: I'll be hosting a guest post from the author on my blog soon. Elijah's Coin is certainly an intriguing read--like a cross between the Shack and Pay it Forward. I certainly enjoyed it, and, if you come back to my blog soon, you'll find out what inspired Steve O'Brien to write it. The Last Druid, by P.L. Crompton: I'll be dreaming druids and Romans now I've finished reading this. I loved it. A wonderfully evocative tale of England at the end of Roman rule, told in a way that really draws the reader in.